The jumpsuit features spaghetti strap and off the shoulder. 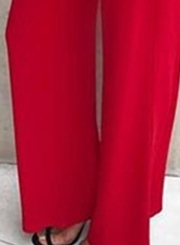 The jumpsuit features high waist and ruffle. Fitted bodice and wide leg pants enhances a slim figure silhouette. Dressing the new jumpsuit style for any easy and chic choice. Accessorizing with some jewelry make it a great piece for party.